It was Thursday afternoon, and I was strolling through the centre of my local town on the island of Crete. I came across a 3-4 month-old kitten which had placed itself right in the centre of the path. The few that had chosen this route at this quiet time of day, either sidestepped around or over this stubborn creature that was obviously not going to move. I sat on a nearby bench and watched. Its infrequent undeveloped meows did not attract any positive attention. On occasion it shifted its seated position, and it became obvious from the limp that the right leg was damaged and was causing pain. It struggled to fold the leg back under its body and opted for a more half sitting posture after selecting its new position, still in the centre of the path. Someone in their ignorance had placed an open plastic pot of cream or yoghourt close by, obviously for the kitten, but it had remained untouched. Why they did not think of a tin of cat food instead, and removing from the can so kitty could get to it is baffling? I left my seat for the closest shop only fifty metres away. After purchasing a can of fishy cat food, I returned a few minutes later to find the kitten still in the same position. Opening the can I scooped out a large dollop with my fingers onto the floor next to the bench. With a little objection from the kitten, I gentle removed it from the centre of the path and placed it next to the dish that I had prepared for it. After a few sniffs it took small but meaningful mouthfuls. I was expecting it to devour the whole lump with gusto, but it did not. It came as a surprise that it only swallowed about a quarter of what was on offer. From my memory of kitten meal times, the whole offering should have been swallowed with great enthusiasm within a few minutes, and that would be from a well fed growing kitten. This was a hungry, abandoned, a bit bedraggled and injured. It limped off leaving behind the remains and scaled the low wall behind my seat, dropped down into the rough ground of ivy and weeds and settled into a comfortable bed of fauna and stayed there. I watched; wondering just how bad this unfortunate creature really was. It needed a vet to tend to its leg and more. One strange thing about this kitten which I did not understand at first was this. As it moved its head or attempted to walk, white lines would appear through its thick black coat. These lines about 5-8 cm long would reveal themselves then disappear, and show in different areas around the neck and on the front of its body as it moved. I thought maybe the bones were broken, but it would be in a lot more pain, or that there was something on or in its coat. As the kitten was completely jet black, I discovered that those obvious white lines were the skin under the fur being exposed as it moved, easy to see against the dark coat. Because this kitten had a full coat, it was difficult to see its condition underneath. It looked healthy and it just needed its leg tending to and a good feed. That is what all the passers-by would have assumed, but that was far from the truth. This kitten was starving to death right underneath everyone’s feet, and no one could care a dam. I rushed home, collected the cat cage and dashed back. The kitten had vacated its leafy bed and was now sitting on the other side of the road on the edge of the pavement. It mustered enough energy to try to evade my attempts to capture it. It should have not been that difficult, with a bad leg and all, but it scampered off between the large white flower pots. However, I was wrong, and I was forced to resort to a desperate tactic as the arched shaped holes in the wall came into view. If it made it through them, I would not stand a chance of catching it and provide some care. I leaped for the tail as it was just about to disappear into the darkness inside the building through those holes. Success, it yelped, then meowed a warning threat as it bared its teeth and lashed its legs while lying on its back. I became concerned that I may suffer scratches or a bite; I did not to my surprise. I could feel its bones under the skin as I picked it up, definitely not well nourished. Carefully, I placed it through the roof of the cat cage onto the soft sheeting, closed the wire roof door then secured it. It settled in without any further physical struggle other than from its vocal cords. I endured a harsh piercing whine which filled the car all the way back to my apartment. I hastily spread a soft towel on the kitchen table and lifted the kitten out of the cage. There was little or no struggle as it was too weak to resist. As it sat on the towel I stroked along the back and under the chin on the chest to comfort and give reassurance that it was in good hands. At this point, it became clear what these white lines were. Beneath the fur was bone and not much else. As the kitten moved, the flesh folded around the bone and became exposed as there was little or no body fat left. The thick black coat was covering up the extent to its critical state of dehydration and lack of nourishing food. Bones could be felt all over its body. Its movement was slow whenever it attempted readjusted it sitting posture, but it seemed lively as its meows were clear and passionate. This was a good sign that with some loving care it could be brought back to full health. I could not afford the cost of a vet for an antibiotic and nutritional injection to give it a kick start on the road to recovery; this would have given it a better chance of survival. 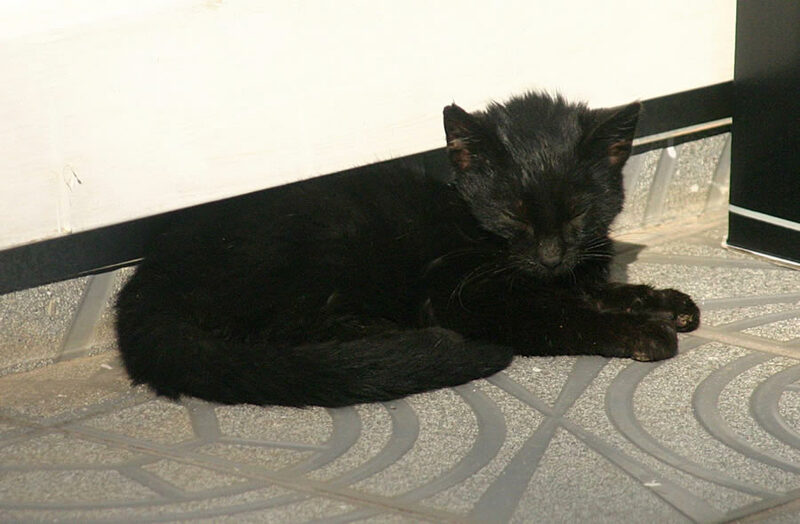 Kitty would not have got through another night in this condition; it was literally sitting around waiting to die. So, I was now it best option. The next step was to get water and food into its body and to see if it would pass through its system. I thought to give the kitten a name, as not sure of the gender, Kitty seems appropriate. Placing a bowl of cat food next to its tiring body it took a few mouthfuls before it gave up. That’s not enough to build body fat, not a good sign, maybe its organs could not function properly just yet. I then placed a bowl of water close by, this it ignored, strange as it was totally dehydrated and needed water desperately. I proceeded to force water from a syringe by holding the skin just behind the head to keep it stable. Lifting slightly and pulling the head backwards, I forced the syringe into the backside of the mouth and injected water slowly in small doses to the back of the throat taking care not to choke. Kitty had no choice but to swallow, and to my relief it did. I would let go and give the water time to get into the body. Kitty gulped and licked the fluid from around its mouth. A good sign so far, there was a little spasm at first as though the water was going to come right back out. It stopped, I guess Kitty’s system was slowly shutting down and would need time to restart. I repeated this several more times until there was a refusal to take any more. At least, it would take in the essentials even in small quantities; it would take time and patience to restore to full health. Relieved we stood a chance without a vet bill, I placed Kitty back in its sleeping quarters, placed the cage outside the kitchen door to give it the freedom to roam if it chose. I proceeded to surround the cage with cardboard boxes and a plastic covering to hide it from the prying eyes of other cats and to provide some heat insulation. I placed bowls of water, dried and wet food in easy reach for it to help itself through the night period. The logic was simple, if it got through another night, we had a chance. At this point I made a mistake, well not so much a mistake but a miscalculation in judgment. Even though Kitty was still alive the next day and had not deteriorated any further as I could tell. I should have provided a heated bed for it to keep its body temperature up. However, not having the recourses like something as simple as a water bottle, and really I could not afford to spend more money on something I had would not use again; I let this error dictate the fate of this defenceless creature. Next morning, the food bowl was empty and there was a faeces close by indicating nourishment was passing through its body. A good sign, a meow came from the back of the cage, so I provided more food trying to entice it out. Success, not sure if it was taking in water so after a few mouthfuls of the meat, I placed Kitty back on the kitchen table, and syringed as much fresh water as I could into its mouth in the hope it would swallow into the stomach. It worked. As the day was bright and warm, I placed Kitty outside to roam freely in the sun. It appears it had a different idea and crept back into the cage after a quick exploration of its new location. Happy that it had taken to this, I left Kitty to its own devices with the intention of checking in a few hour’s time. Several hours later I wandered outside only to find that Kitty had vamoosed. A quick scan of the area within a twenty metre radius did not reveal its location. I seized a rubbish bag with the intent of scouring the hedge row on my travels to the community bin. It did not take long to find Kitty snuggly settled in on a pile of ivy leaves and twigs. It must have felt more at home and comfortable here than on a soft white sheet in the cat cage. On return, I scooped up a pile of the same fauna and padded a low sided cardboard box. 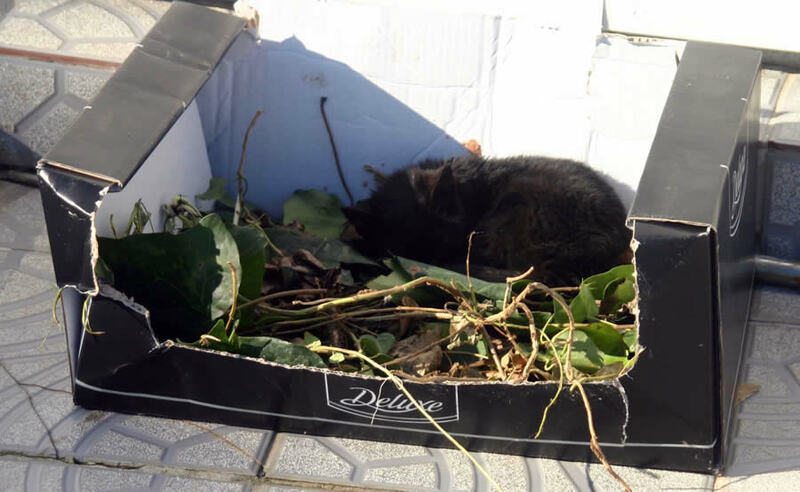 As Kitty’s preferred mattress type was in the shade, and the sun was out in full, it was best to move it to let the natural elements warm up its frail body. I gentle lifted Kitty into the ivy, twigged and leafy padded box and transferred it to a sunny location. This time of the year the sun is not that strong so should only aid this struggling kitten. It seemed happy with its new heated environment, and after shifting a few times settled for a semi-curled up shaped pressed up against one side of the box, and in time fell asleep. I placed water and food close by in case it decided to top-up on awakening. If it got too hot the sides of the box would provide shade if it needed it. I was deeply concerned by now that its food intake was nowhere near sufficient to increase its body fat. Maybe little bits at a time would be enough for now to keep it alive and to get the body functions operating normally again; I did not really know and could only use guesswork from my limited experience. I wish I was flush with cash because I would not have hesitated to get kitty to the vets. It is Friday, and the vets would soon be closed until Monday. I knew any trip there, would incur a cost of at least twenty euros for injections and then a consultation fee. Several months previous one of my own cats was poisoned, and that took sixty five euros in vet’s fees to try to keep her alive, and was unsuccessful. With no income and living off a dwindling pot of money that is nearly exhausted, finding spare cash to help this unfortunate creature was beyond my means. While Kitty was soaking up the sun, I took the opportunity to pad out the cat cage and covered the white soft sheeting with a natural bedding, ivy, twigs and leaves. I intended to bring Kitty into the kitchen this evening and wanted it to feel normal to its instincts. I hoped it would provide a home suited to its liking. During the day, Kitty moved around the open spaces keeping itself in the sun and vacating its box for the solid mat of a tiled floor. It amazes me how cats are capable of sleeping on anything, no matter how hard or dusty a surface may be. I noticed that every time I would come close to check on its status, it would open its eyes a little and keep track of my movements. I disturbed it sleep after another few hours and forced into its stomach more water in the usual manner. I also prepared some warm liquid food from some dried cat biscuits to get nourishment into it in the same way. All seemed to be going well and Kitty appeared to be getting in on the act and gulped back all on offer, until it did not want anymore that is. Kitty would clamp tight its mouth and teeth making it difficult to get the syringe in, and when I did eventually succeed Kitty simply refused to swallow. That meant the food stuff would dribble back out onto its coat which I would then have to clean with a warm soft cloth. The protruding bone structure hidden by its black coat could be easy felt and reminded me just how undernourished Kitty was. I would not have liked to have seen Kitty’s body under that fur. But at the same time, I think the fur covering the bony body produced the false illusion that kitty had a chance, when Kitty should have been at the vets in a cage with a heated floor and professional medical care. All its walking movements where slow and staggered, but Kitty did manage to move about like this, I took this as a positive sign. It would take patience and time to bring Kitty back to health. I was now committed. We were slowly developing a bond, and like most cats Kitty loved being stroked and having its tummy tickled. Kitty rubbed her head against my hand on occasion; trust and affection were being developed. I took this as a sign that kitty would fight for life and not give in so easily. That late afternoon I placed Kitty into the cat box and moved all into the kitchen. I left the top open as well as the front so that Kitty had the freedom to exit at will and roam around the kitchen. I did not want to foster the understanding that it was being restrained. I placed a food bowl with wet and dry food in the cage at the opposite end to the open side. I also placed a water bowl just outside, again within easy access. Kitty was settled in the middle on the bed of ivy and fauna and appeared content. It ate some of the offering which I replenished before I retired some hours later. At first kitty sat, and the eyes could be seen over the edge of the cat box watching and taking an interest on the happenings in the kitchen. Making no attempt to leave, even though welcome to do so, remained within the cat box. I was unsure if the kitchen would be warm enough all through the night. There was nothing I could do to help raise the temperature as I do not have any extra heating in the kitchen. I was not prepared to leave the gas rings on all night; I did not feel safe with that. Images of some strange unimaginable event setting fire to my home streamed across my imagination. The living room was not that much warmer, and I could not risk poops all over the carpet by the next day. I just fathomed that the kitchen would be kinder than the outside. I really needed that hot-water bottle to go under the bedding, but that would have gone cold through the night, and without a top-up would not have been that much help by the early hours of the morning. However, it might have just been enough. Again, I would have had to lay out some more cash as I did not have one. I had been across to the local supermarket before trying to purchase one without any luck. In a warmer Mediterranean climate like Crete, such things are not that easy to locate. If I tried to cover it, kitty reacted as though being restrained, and would soon shake off any attempt to contain its body heat. Just before lights out I watered and injected more warm liquid food into Kitty before putting back into the cage, I hoped its cosy bed would get it through another night. I did not have any cat litter. I had a tray but no litter, and the next morning as I had anticipated, several piles of processed waste were located on the kitchen rugs. Not a problem to clean up, but a good sign that Kitty was leaving the cage, wondering about and food was passing through the body. It made sense that sometime today, Saturday; I would need to get a bag of cat litter and fill the try for it to use as this was going to be a long haul. Kitty was stretched out on its fauna mattress. I noticed all the food had gone from the bowl, another good sign. I gently touched behind the head, not sure if Kitty was still alive. That stimulated a response as a meow and shuffle raised Kitty into the seating position. I cleaned up the small piles of poop and quickly slung the rug into the washing machine. Green eyes peered over the top of the cage. I lifted Kitty onto the table onto a soft towel, prepared some warm liquid food and proceeded with the feeding ritual. Kitty gulped a small amount before refusing anymore. The body gave so minor convulsions, not sure if was going to come back up. I waited and watched relieved its system did not reject the nourishment. Still concerned that enough food was not going into its body, I committed myself to taking Kitty to the vets first thing on Monday. I would just have to suffer the cost. I washed and dried Kitty with warm water which I believe it enjoyed, or tolerated because it was too weak to rebel. The gas rings had been turned on to warm the kitchen. I left Kitty on the table while I inspected the cat box. The fauna mattress felt a little moist, not sure if that was good or bad thing. Later, I placed it in the sun to air out and dry. As Kitty had got through this night, I felt confident that it would get through two more until Monday. Later in the morning as the sun rose, the rays warmed the outside area, and again I put Kitty outside to enjoy the benefit. We sat and slept together for most of the day as I had decided to do the same, enjoy and relax in the sun. Kitty mustered the energy to move around exploring the area. At one point, I had to take special note of its activities as Kitty was wandering too far away. Some of the local cats, while passing through took some interest to this new addition, but they did not create any hassle and just wandered off after their curiosity had been satisfied. However, all was to be ok when it made the decision to turn around and come back. Kitty climbed over the rocks in the small garden, slowly and a bit clumsily, but nevertheless it had the energy to do so. All seemed good, and feeding times about every four hours passed without any hitch. I noticed when I retired to the flat to get a drink or something to munch, Kitty would attempt to follow. When I returned Kitty had only covered half the distance and would then turn around when I reached our resting spot again. Bonding, which is good because I believe it would produce an incentive for Kitty to live. Late Saturday afternoon as the temperature was beginning to drop; we both retired indoors to the kitchen. I wanted to try and wean kitty off the green fauna mattress as I was little concerned of its dampness from the night before. Not sure if sleeping on that was good, so I made the decision to remove it. I had purchased cat litter and the tray was now full. The question was, would kitty use it and save me the effort of cleaning up? I had a plan. I placed the cat cage at one end of the kitchen between a table leg and the wall. The litter tray spanned the gap from the edge of the cage to the table leg. I blocked access to under the table with a cardboard barrier and placed another cardboard on the kitchen side of the litter tray. So this construction provided a small space for Kitty to wander around in, but had to climb over the litter tray to access the rest of the kitchen before being stopped by another barrier. This area I covered with a small rug; it could poop on that if it could not master the tray. I placed water and food on the carpet instead of in the cage. So now hemmed in by two walls and two card barriers we were set for the night. If kitty got the hang of the litter tray, then I would move all the barriers the next night. Simple really. After a good feed and a wash on the kitchen table, kitty was ready for another night in its new home. I placed Kitty on the soft sheet in the cage and prayed that would be it for another day. To my surprise, Kitty was quite vocal from the cage. I wondered if I had made a mistake removing the green mattress, and this was its disapproval. There was no attempt to vacate onto the carpet; it just sat there producing mild screeches with short intervals between each. Not sure what the problem was, but I wish I had not made those changes so quickly. I can put it back tomorrow and see what happens then. It’s about 07.45 Sunday morning, and I had emerged out of sleep sometime early and I was just too lazy to brave a chilled room. Snuggled under the covers, not wishing to move, a loud desperate meowing came from out of the kitchen. I pounced out of bed, threw on a warm jacket and dashed to Kitty’s aid. Hungry I suspected and wanted feeding, or had it escaped the small enclosure I had built and could not get back in. Kitty lay stretched out in the cage. The food bowl was still full and had not been touched. There was evidence it had used the litter tray, probably more than once. There was also evidence that it had missed on one occasion from the pile on the rug. So what’s up, I did not like the position Kitty was in and had made no attempt to raise itself with my presence. The meowing turned to a whining. This is not good and there was only little movement in its body, even the head was not moving. The whining got worst and sounded as though Kitty was in pain, or just hungry. I lifted kitty onto the table and the whole body had gone limp. Lying stretched out the body felt cold, so I quickly wrapped it in soft towels to keep it warm. I feared the body temperature had dropped too low during the night. Thirty six degrees are a lethal level from the normal thirty nine degrees. If kitty’s body was not producing enough body heat, then this could be very bad. I heated water in a pan on the cooker, then found a small glass bottle and made a hot-water container quickly. I placed that under the towels and next to its body in an attempt to get some heat into it. I positioned a chair at the table about where its head was. I sat down and prepared a syringe of water and tried to get that into its stomach. No luck, Kitty just lay there. I was not sure if Kitty was still alive at that point. I stroked its head and face and then rolled the warm-water bottle over its body under the towels. There were signs of movement and the eyes were open. The legs were struggling to move. I saw this in Doodle just before she died from poisoning. A desperate attempt to get up, but as there was no life left in the body she was not able to manage it. So here we are again, all I could do was to speak gently to Kitty and tell it to go to sleep. There was nothing left I could do. I began to remove the water bottle, but as I lifted the towelling, Kitty’s legs, all four of them began to thrash around slowly; it then rolled over onto its back screaming with what sounded like painful cries. This lasted for about fifteen seconds before it rolled back onto its side. I returned the towelling around its body. Kitty lay there, motionless. I stared into its eyes and stroked its face with gently fingers and spoke soft words. Kitty was still alive; it made its last barely audible meow as I stared into those eyes. I witness the spirit of life leave at the very second. The eyes were bright and open; they closed slightly and then a darkness came over them, and Kitty was gone. I had a sense that the spirit had come out of the body, but it was only a sense. Maybe I had just caught a glimpse of the spirit of life that dwells in all creatures. I sat there for a while, there were no tears. I had been through this with Doodle. I did my best. I will now agonise for a while if I could have done this differently and better. If I had the money, Kitty would have got to the vets and stood a chance. I misgauged just how bad Kitty was, and did not have the resources needed to keep it alive. A warm or heated sleeping place is a must to keep the body temperature up. I will have to consider whether to intervene again, maybe it would have been best to have left Kitty in the street. At least, I gave it a few days of comfort. Should I have left those leaves in another night? Should I have raced around and found a hot-water bottle, even though it was more expense to me? Was it a drop in Kitty’s body temperature that night that finished it off? It could have been. Should I have gone to the vets straight away and suffered even more expense that I could not afford? I will never know. I buried Kitty on the beach next to Doodle later on that day, Sunday.